Turn The Heat Up! Design This fantastic fan assisted oven offers you a nice and clean stainless steel finish that will suit most kitchen styles. The easy grip silver controls allow you to easily adjust the oven functions and the small bar handle looks sleek and gives you a real minimalist look. Capacity The capacity is the size of the interior of your oven. 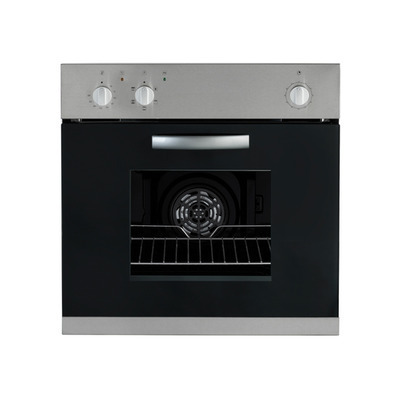 This oven has a capacity of 59 litres which provides you with plenty of room to cook a full family sized meal. The oven comes with 1 wire shelf and a grill pan however the large space allows you to fit additional shelves in if you wish to. This model requires the ART00805 How_it_works This oven works with upper and lower heat elements, with a fan at the rear of the oven. Fan assisted ovens are the perfect choice as the rear fan gently circulates the warm air around the oven avoiding hotspots, giving a much more precise and even cooking performance. Functions Offering 5 functions, you have the flexibility to cook just the way you want to. These are: Oven Light Upper and Lower Heat Element Fan Assisted Maxi Grill Fan Assisted Grill Lighting A fantastic feature offered is the interior lighting which will illuminate the oven allowing you to keep an eye on your food whilst it is cooking away. Door_type The double glazed door helps to retain the heat whilst the fascia cooling feature keeps the control panel cool to touch when the oven is in use. Timer The handy minute minder in the middle of the control panel gives you the opportunity to set the cooking times ensuring now food is left in for too long. Energy_efficiency The oven has been given an ‘A’ energy rating meaning you can use your oven without running up high energy costs. Please Note This appliance does not come with a plug. A cable is attached and we recommend hardwiring this to a fused spur unit. We now offer an installation service for ovens and hobs. To find out more please gives us a call on 0330 0080 800. Please check the dimensions before you purchase. Items that do not meet your measurements must be returned at your own cost. Please do not organise fitters or book days off work for the installation of appliances until you have received your products. We cannot be held liable for any costs incurred relating to this.